When we think of trading psychology, we typically think of the psychology of the trader and the factors that either contribute to or distract from a peak performance mindset. Another facet of trading psychology is reading the intentions of other market players. This is very similar to psychology in poker. The mindset of the poker player is important, and it is also important to read the psychology of the other players at the table. The skilled poker player reads those tells from other players to infer if they are bluffing or if they might be holding the nuts. When short-term trading/market making occurred on the trading floor, reading the other participants in a market truly was more like reading other poker players. With most market activity being electronic, we need other ways of inferring the intentions of market participants. 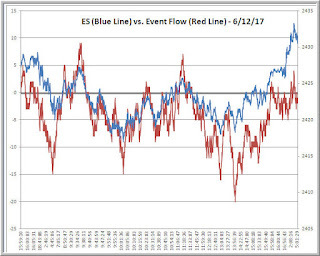 Above we see a chart of what I refer to as Event Flow for yesterday's session in the ES futures (6/12/17). I will be discussing this measure during this afternoon's free webinar and in particular detail at this summer's workshop in Chicago. (Here are details regarding the webinar and workshop). In a nutshell, what I'm doing with event flow is breaking down the day's action into volume-based events, where each bar represents the price action of each 1000 contracts traded. What I'm interested in is the price behavior *within* each bar. If price closes more toward the high end of the bar, I will categorize that bar as a "buying" bar and vice versa. The chart depicts a cumulative running total of buying and selling bars, in the manner of an advance-decline line. Most of the time the Event Flow line will follow price relatively faithfully. It is the divergences that are of particular interest. Notice, for example, how sellers were dominating in the afternoon, but ultimately were unable to push prices below their morning (and below their previous day's) low. The inability of sellers to move price lower (or vice versa) creates a situation where those participants will be forced to cover when flows and prices turn. Note the nice rally in ES (blue line) after sellers are trapped in the afternoon. Event Flow is a complement to other ways of inferring the psychology of market participants, such as upticks/downticks (NYSE TICK) and Market Delta. Event flow is easily constructed for any instrument trading centralized volume. It is also relatively robust with regard to the participation of optimal execution algorithms, as noted in quant research (see here and here). Algos may be buying bids and selling offers in an efficient manner. This would not necessarily show up in measures of upticks/downticks but would be reflected in price behavior within thin volume slices. Event Flow can be aggregated over longer time frames to provide bigger picture views of market participant bullish/bearish psychology. I've generally found traders much more interested in focusing on their psychology, rather than the psychology of the markets they're trading. That's a big mistake. Typical price charts are far too blunt as tools for assessing the psychology of the marketplace. With Event Flow, we don't have to track the market transaction by transaction but can still obtain a relatively finely grained assessment of how those close to the market are behaving. I look forward to sharing more at the webinar this afternoon and the workshop in July.